Because we’re not blessed by abundant fresh Porcini like the Italians we need to be a little inventive to capture the flavours and effect of a genuinely Italian recipe; this one delivers the goods in spades. If you find some fresh porcini grab them with both hands but otherwise try this mixture of wild mushrooms and a handful of dried porcini to boost the flavour. Put the dried porcini in a bowl, cover with hot water and leave for about 30 minutes. Meanwhile, clean the fresh mushrooms – wiping them with kitchen paper should be sufficient rather than washing them. Cut them into thick slices. Lift the porcini out of the water and cut into small pieces. Finely chop the shallots, put them in a large sauté pan and sauté with the olive oil and butter until soft. Add the garlic, half the parsley, a little salt and lots of pepper. Cook, stirring, for a minute and then add the porcini. 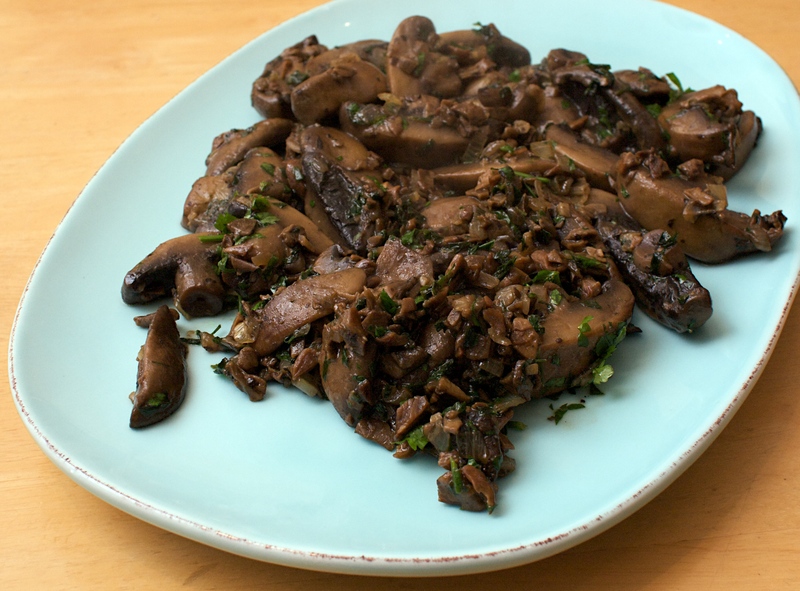 Cook for 5 minutes or so and then throw in the fresh mushrooms and some parsley. Cook over a fairly high heat for about 10 minutes, making sure mushrooms don’t stick to the bottom of the pan. There should be very little liquid left by the end of the cooking. Sprinkle with the last bit of parsley before serving. Oh I wish we had fresh porcini mushrooms also. Since they are not available in New England, I will make your recipe.